I’ve never had a beer from New Zealand. I really liked the packaging. Definitely eye catching! I’m always on the lookout for a new Imperial Stout. 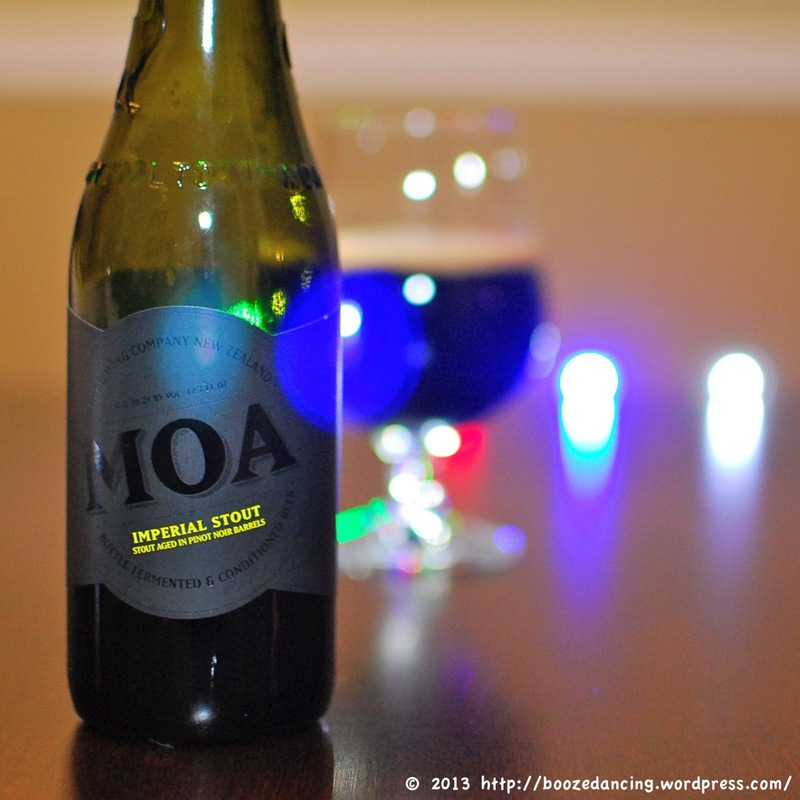 MOA Imperial Stout Barrel Reserve is a very strong, upfront and rich offering of this famous Moa style. Aged in oak Pinot Noir barrels, this beer not only displays coffee and mocha characters but also some sweet and savory notes unique to Moa Imperial. This award winning Stout is seasonally produced and available for short periods each year. Appearance: Pitch black color with lots of fizzy carbonation. The head maxes out at about an inch and a half, then slowly dissipates and leaves an eighth of an inch of tan foam along the top of the beer. A wee bit of lacing. Aroma: Had to let this warm up a bit before I could pick out any interesting scents. After about 15 to 20 minutes, you can clearly smell the bittersweet chocolate and light coffee scents. Thanks to the fact that this was aged in Pinot Noir barrels, I can definitely pick up some overripe grape scents as well as a healthy dose of oak. Taste: Very soft and creamy mouthfeel thanks to the bottle conditioning and residual foam. Definitely picking up the bitter chocolate at the onset. Also getting a cigar tobacco flavor as well as some of the wine influence, i.e. musty grapes and oak barrel. Dry, ashy finish. I’m not quite sure how I feel about the MOA Imperial Stout. If I were going to compare it to something else, I would actually have to compare it to not one, but two different beers. This tastes like a Maine Beer Company Mean Old Tom and Cigar City Maduro Brown mash up. While I like each of the individual flavor components on their own, I’m not sure if I like the way they come together in the end. I like the texture, and I’m particularly impressed at how it hides its high alcohol content, but when I get to the finish, something tastes a little off. There’s a bit too much of an ashy tobacco flavor for my taste. I think I need to try this one again. Just so happens that I had this one in my hand a few days ago but put it down in favor of Southern Tier’s new Live instead. Based on your review it seems I made a wise choice. Odd really, because i hadn’t expected to make any of those that day – it’ll come back to bite me in the end (which is why I’m going to wear pants all day today). I’m all about fusion cuisine – occasionally even confusion cuisine – but it doesn’t work for me as well in craft beers. Not usually anyway. Perhaps I’ve been unlucky, but the few New Zealand brews I’ve had have been unimpressive. Could be that the Nelson Saivin or other traditional NZ mango/tropical hops really need to be very fresh to shine. In any event, I can certainly see why you had to pick up that bottle and why it caught your eye – what with that bright blue alien light bubble thing attached to it. You bring up a good point re: the freshness factor. I mean, it took those NZ trolls, hobbits, elves, and other fantastical species a lifetime to make it to Mordor so that they could ditch that crazy ring of theirs (I’m sure JewTalia would have given them a fair price for it had they made the trip to Philly. And they could have avoided the Orks too! ), so who knows what happened on this beer’s journey from NZ to South Jersey. They had that one on the shelf too. Though the one I bought was far from great, based upon your impressions, it sounds infinitely better than the Breakfast. A multitude of storage problems could have occurred while this beer was in transit, so for me, the jury is still out on this Brewer. You’ve never had anything from Epic Brewing (the one from NZ)? Their Armageddon IPA is fantastic. Better beer shops around NYC tend to carry their beers, so you should be able to find it. I look forward to your review.